The deserters were charged yesterday. 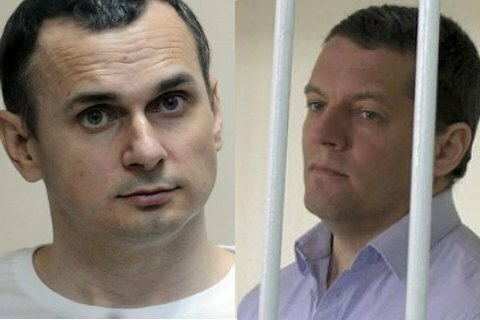 Journalist Roman Sushchenko and film director Oleh Sentsov, Ukrainian nationals held in Russia, can be exchanged for former Ukrainian servicemen Oleksandr Baranov and Maksym Odyntsov, Ukrainian ombudsperson Valeriya Lutkovska's office has said. The ex-servicemen defected to the Russian army and were convicted by a Ukrainian court for high treason and desertion. "Ukraine is preparing to have political prisoners Sentsov and Sushchenko exchanged for Crimean deserters Baranov and Odyntsov, who were sentenced to 13 and 14 years of imprisonment respectively," Pryamyy TV learnt from Lutkovska's office. Oleksandr Baranov, a junior sergeant on the contract service of the Russian Armed Forces, and his fellow serviceman, warrant officer Maksym Odyntsov were detained at the Chonhar checkpoint on the administrative border between mainland Ukraine and Crimea as a result of a special operation by the Security Service of Ukraine (SBU) on 20 November 2016. Ukrinform correspondent Roman Sushchenko was detained on 30 September 2016 when he came to Moscow on a private visit. Russia charged him with espionage. In 2015, Ukrainian film director Oleh Sentsov was sentenced to 20 years in a Russian colony on charges of terrorism.